Delores is a client who recently spent time recovering at our Respite Care facility. She has now reconnected with some family in Kansas. We are so happy she is well and no longer homeless and this thank you note was most appreciated by our staff. Ruth is one of our most celebrated success stories in support of the Permanent Supportive Housing concept. She is one of the original three chronic homeless persons placed in the A Step Up Housing Program. Ruth F. was admitted to the Ascending to Health Recuperative Care Program in October of 2014. She had been admitted to the Hospital for exacerbation of COPD and poorly controlled Diabetes Mellitus. She had been living with friends, family, or the streets/shelters for years in Colorado or California (Where she was a successful artist). Ascending to Health provided a safe place to recover and immediately connected her with a Primary Care Physician to get the Diabetes under control. It was soon found that Ms. Ruth had likely Alzheimer’s disease that prevented her from managing her diabetes effectively. She would often just forget to take her medicine. 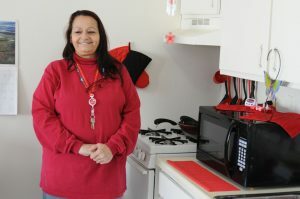 Ascending to Health Respite Care was able to place Ruth in Permanent Supportive Housing Program that was just starting at the time, with her chronic homeless history and disability, she qualified for placement. Because she now had a connection to a Primary Care Doctor and continued access to supportive services, she has been able to get the diabetes under control. She has also stopped tobacco use and there has been no further issues with COPD exacerbations. Thus hospitalizations and ED visits soon ceased. She is currently being supported in her apartment with home visits by personnel trained in providing support to Alzheimer’s patients. Tanya R. was admitted into the Recuperative Care Program upon discharge from the hospital, needing recovery from severe pulmonary complications. The Recuperative Care Program played an essential part in her recovery. Tanya had been doubling up with friends, but once she fell ill she was not allowed back into the home. Ascending to Health provided a safe and supportive place to convalesce, connected her with a Primary Care doctor and Client Navigator who helped coordinate follow-up specialty appointments, and provided nutritious meals to enhance her recovery. Our SOAR Administrator found issues with her Old Age Pension that was not paying the amount for which she had qualified. Once corrected, and once fully recuperated, she was able to save money and enter subsidized housing. If Ascending to Health Respite Care had not existed Ultimately, without Recuperative Care services, Tanya have been discharged from the hospital to the local emergency shelter, warming shelter, or the streets. Her was such that, without the proper support and case management she would have likely suffered severe complications and numerous readmissions to the Emergency Department and/or hospital. Today she is healthy and enjoying her own apartment.